The slices needed to be small because the cake was so filling and rich. We loved it! I try to review a new product that I have tried from the previous week. 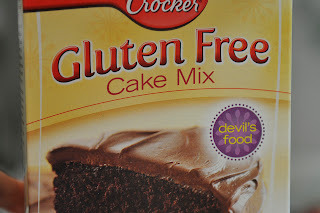 This week I have chosen to use and talk about Betty Crocker's Gluten Free Cake Mix, Devils Food. 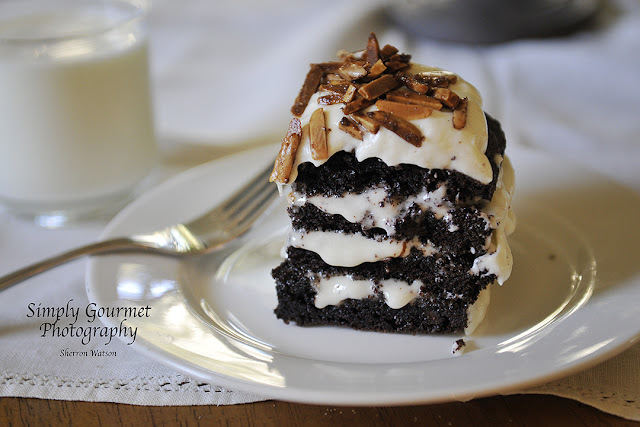 Please keep in mind that this recipe can be made with any brand of chocolate cake mix. We use GF products because I have Celiac and can't eat wheat flour. Feel free to skip the review and go straight to the recipe below. Baking is always a challenge when you first have to starting cooking with so many new flours and starches. A combination of flours and starches are necessary to achieve the balance in your baked goods that the single "wheat flour" satisfies in most recipes. I remember making several things and having them not turn out. I have baked for 25 years and then to have failures was a bit of a downer. I was reluctant to pay top dollar for a pre-made cake mix. What is top dollar? $10.00 for a cake mix!! That is steep to me. But, I did it. You get desperate...there are birthdays, parties and special occasions that you need a cake for. The flavors of Amaretto, toasted almonds and hazelnut frosting was amazing. Oh yeah, the chocolate made it DIVINE! Texture. One word that dictates my GF experience. I don't eat Jello because it feels funny! I don't like straight whip cream because my mouth can't standing the feeling of it on my tongue. Yes, I have to like the way the food feels inside my mouth. Some cakes are gummy, too soft or just taste bad. I was soooooo glad when Betty Crocker started making their cake mixes. The first thing is, they are reasonable in my world...$3.49 for a box. It will cost me way more to buy the individual ingredients to make it from scratch. BONUS. The cake was easy to make. BONUS. 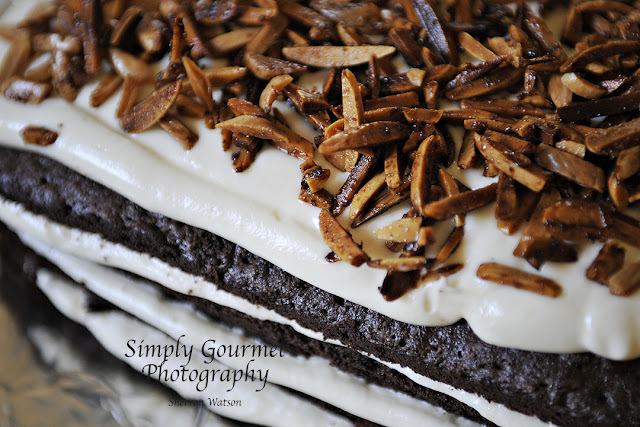 It tasted great and the texture of the cake was airy..like real cake. BONUS. I loved it! What you see on the box, is what you get. Thank you Betty Crocker for making a reasonably priced cake mix that taste great for those that can't eat wheat. See below for the recipe that I used to make my cake. I use a cookbook by The Cake Mix Doctor specifically with gluten free recipes in it. I should note that she uses only cake mixes in her recipes combined with other ingredients to create the flavors. I chose to try her recipe for Chocolate Chip Amaretto Cake. The recipe is not listed on her link, so I will list it below. 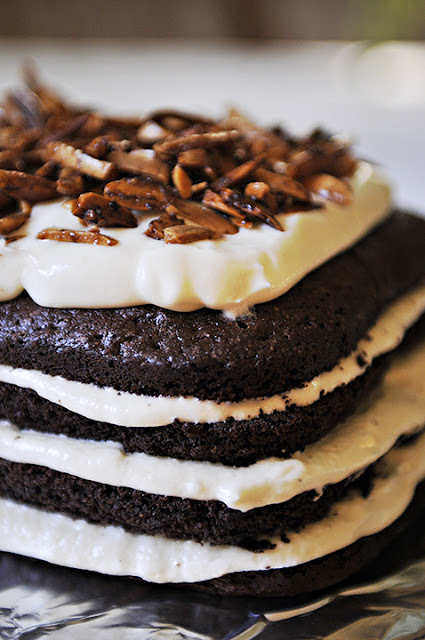 Again, any REGULAR CHOCOLATE CAKE MIX CAN BE USED TO MAKE THIS CAKE. The original recipe was also used as a Bundt cake. I don't own this type of pan, so I used what I had. I used two glass, 6X10 baking dishes. I love the size it made two, similar to as if I had used two rounds. I wanted the four layers and this size was easier to cut in half than a larger pan. Preheat oven to 350. Spray pans with cooking spray and dust with flour, GF rice flour OR cocoa powder. I used cocoa powder. Combine the first 7 ingredients in a large mixing bowl. 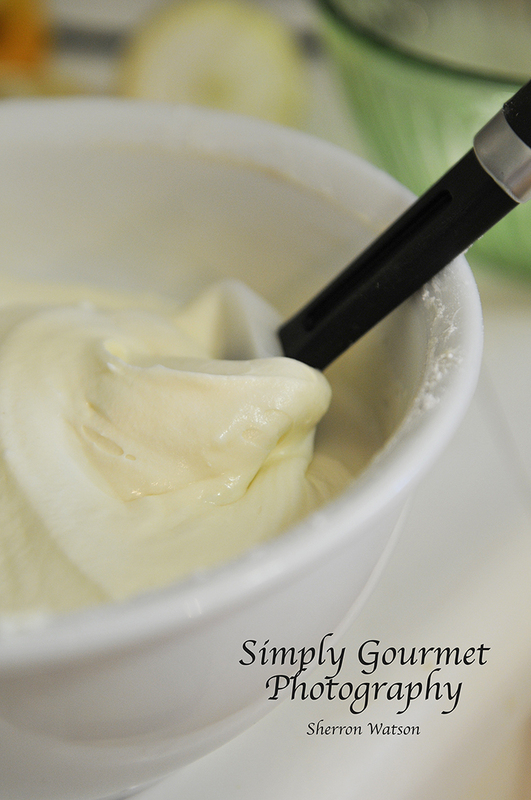 Using a hand mixer, mix for 2 minutes. 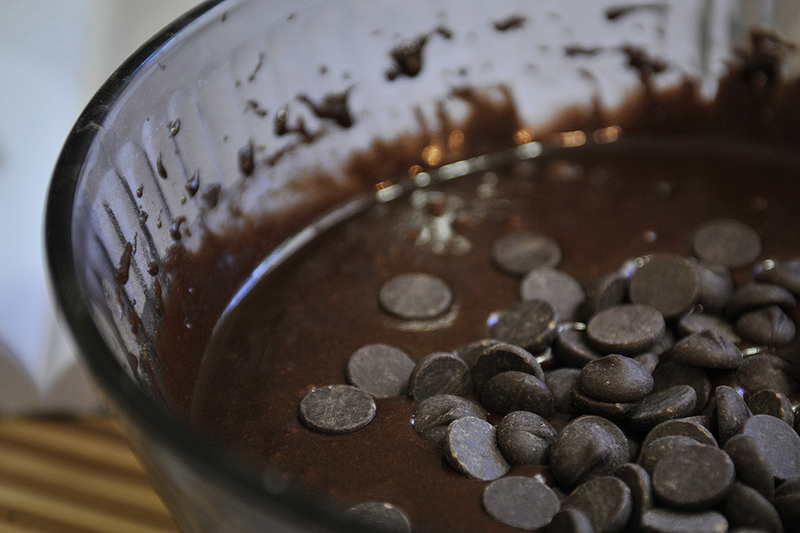 With a rubber spatula, fold in chocolate chips. Pour mix into prepared pans. Bake until the cake top springs back. 30-40 minutes. Use the tooth pick test to see if the center is cooked all the way through. Let cakes or Bundt cool for 10 minutes and transfer to a wire rack. The recipe calls for mini chocolate chips, I only use Ghirardelli 60% Cocoa chips and they don't make minis. It worked out great. The frosting recipe was also used on my Banana Muffins. For a cake use the full recipe, but for cupcakes use only half of the recipe below. 6 cups of powdered sugar. This frosting should be spreadable, not runny. Add enough powdered sugar to get the consistency you want. Also make sure your cake or cupcakes are completely cool or it may start to melt and become too soft. To add the flavoring of your choice, use 1 -2 T. I used Hazelnut. The syrup will thin the frosting, but if you refrigerate the frosting, it will become stiff enough to pipe or spread. My 4yo loved the frosting. 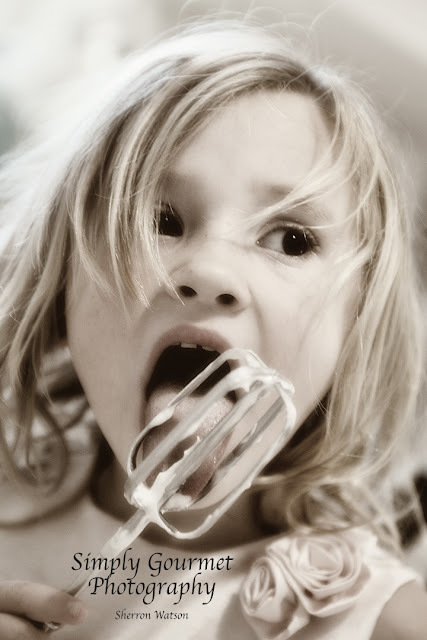 This was the first time she wanted to lick the beater. Coat almonds with butter and sugar/cinnamon. Bake on a cookie sheet for 10-15 minutes. Watch the almonds, they will burn if you cook them too long. Let the cool and they will get crunchy. Sprinkle on the cake when finished frosting. To create the four layers. I cut each rectangle in half. Layered the cakes with the Hazelnut Frosting. If you have the time, I would frost the cake and place immediately in the fridge. This gives the frosting time to set. 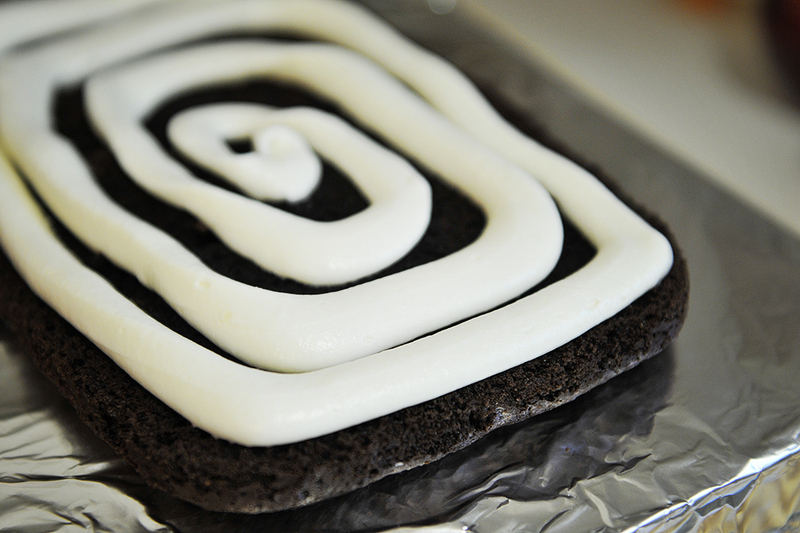 You may find it helpful to use skewers in the cake until the cake and frosting set, about 3 hours in the fridge. I would cover with plastic wrap so that it does not dry out the cake. Enjoy this recipe. Feel free to share or comment!